So now it is time to enjoy a few blog posts from around the internet, the last of 2017, so grab a drink and make yourself comfortable for our weekly round-up. It's the last FFAF of 2017! I want to thank the entire Philofaxy community for another wonderful year. I really appreciate how kind and supportive everyone is. 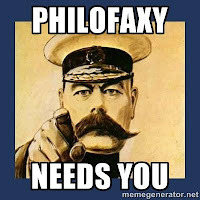 We have a great group of people who read, comment and contribute here on Philofaxy. I'm very happy to be a part of it! Please join me in thanking Steve for all his hard work! He keeps the blog filled with excellent content every day, is on Facebook and Instagram, replies to everyone, and he and Ray do the free printable diary inserts every year. He is a busy guy, and we appreciate everything he does! I also want to thank Nan and Anita for all they do here on Philofaxy, and all they have done over the years! Together we all make a great team. As always on Fridays, feel free to ask/ discuss anything ring-binder related. I am sure we all enjoy seeing how other readers used their organisers. On Philofaxy we have had several different series of posts to help readers share their own experiences of how they use their organisers and which is their favourite one. We constantly need new people to come along to be able to continue with these series of posts. Reader Under The Spotlight - This is based on 10 simple questions (it used to be 19 questions) as well as the questions we ask you to supply a photo of yourself or your organiser. Previous posts in this series can be found here. Readers Favourite Organiser - This is 5 questions plus a few photographs of your favourite organiser. Previous posts in this series can be found here. Experienced User - This is based on 7 questions, mainly aimed at people who have been an organiser used for more than a year or two, but the questions are fairly generalised. Previous posts in this series can be found here. We also welcome Guest Posts and Reader Reviews of organisers and related products. We also have Readers Tips too. There is no fixed format for these. It is best to contact Steve before you commence writing any of these. Guest posts/reviews must be organiser related, Philofaxy will not publish non-organiser related posts... we often receive offers of very non-specific posts, one for example about body weight loss, when I published a post on weight loss in relation to removing pages from your organiser! Clearly they hadn't read our post at all or our guidelines! In all posts we are happy to include a link or links to your own blog or your You Tube Channel or Instagram feed. So if you would like to contribute with any of the posts above please contact Steve by email philofaxy at gmail dot com Please indicate which post you are interested in taking part in and he will send you the questions/instructions. 2018 Functional Planner Setup: Red Pocket Filofax Finchley - Peanuts Planner Co. This was a post on Facebook back in 2013 by Kent from Oz. Lots of people then contributed to the 'glossary' I hope you find it as amusing as I did! ARTIFAX: Using the planner intended for improved organisation and filling it with calligraphy, water colours, washi decorations, stickers, sketches and drawings. BOOMERFAX: Buying an A5 Amazona, swapping it for a personal Finchley then getting the Amazona back because you can't live without it!! FAX EVASION: The dissimulation one embarks on when asked how many binders one has bought. FAX EXILE:An ultimatum from ones spouse to stop buying new binders or suffer the consequences. FAX IT: File a titbit of information under your Filofax reference tab. Fax-of-Life: When you tell your children that the best things in life have two pen loops and 30mm rings! FAXED OUT: Having no room left in the house for more binders. FAXIMUM: The theoretical maximum number of binders one can own. Although in theory this is a mathematical constant it can often behave more like a variable. Faxslap: What you feel like doing when someone calls it a 'diary'! Filandering: Moving into another FF after just having spent a fortune on another. FILANTHROPY: caring for, nourishing, developing, and enhancing the love of all things Filofaxish. Filistine: Those who just do not comprehend. Filo collector, erm to many too list! FILO-dough: the money you spent buying Filofaxes and all you have left over is enough to buy a piece of baklava. Filo-freakout When the absolute worst thing has happened - Your Filofax has been lost or stolen! FILO-SETI-Maniac: fan of Filofax and participant in UC Berkley's search for extra terrestrial life through SETI program. FiloArrhythmia: The immediate onset of Heart Palpitations when you suddenly realise that you've actually left the house without your Filofax. FiloBayers: those that check 3 times a day for new listings on eBay. FiloBox: The simple cardboard structure your Filofax came in which has now been elevated to above gold standards in terms of value. No one comes near that box and it sits farthest away from any water source. FiloBucks: The made-up price you tell your spouse that you paid for your 3rd Malden purchase in one month. "It was on sale--it only cost $75 for that A5 Malden! 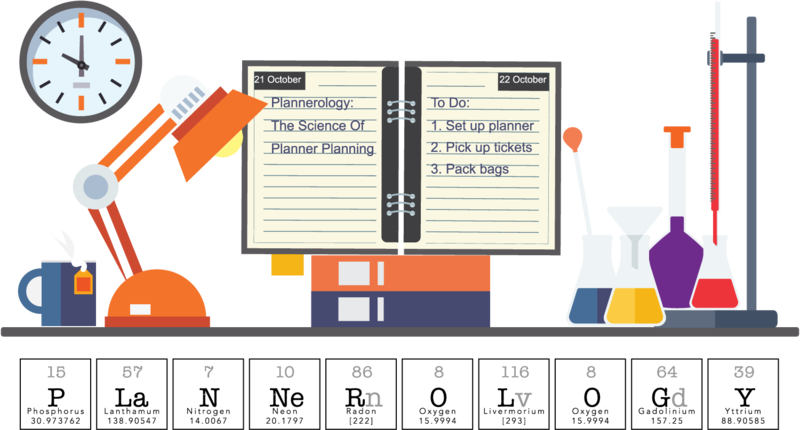 Filobuster: Talking as much as you can about a certain Filofax until your spouse gives in and says "ok already! Just buy it." Filocats: When cats are magnetically drawn to your Filofax: sitting on it, laying on it, sleeping on it, chewing the corners of it, especially when you are trying to use it! A particular favourite are photos of Filofaxes with their cats, or cats with their Filofaxes!! Filocred: Your level of knowledge when posting here. As in: Steve sure has Filocred---I believe he knows what he's talking about. Filocringe: Watching someone open the rings The Wrong way. FiloDeprived: When one's income does not cover one's FiloLust. FiloEnvy: When someone else's Filofax may / or may not be better than yours. Filofairy: Someone who has the uncanny gift for giving true friends their first Filofaxes to get them to understand their world...oh and help them get organised. FILOFART: The unfortunate sound your thumb makes as it rubs against your A5 Cuban after you have just treated the cover with leather cream. FILOFAT: The state you are in when you realize it's time to move up to an A5! FILOFAX ELBOW: Medical condition attributable to using an A5 binder habitually. FILOFLASHING: The act of casually taking your Filofax out for no other reason but to show it off to the people around you. Filoflutter: The feeling you get when you see one in a second-hand shop. Filofondeling: Obsessively stroking or petting the cover of your Filofax in order to asses the Strokability factor or gauge the texture in order to appease your Filolust! That's three words in one definition!! FILOFURY: The unpleasant emotion your better-half expresses when they eventually find out the money for the gas bill was used to pay for another Raspberry Pocket Malden you won on eBay! FiloLust: That rush of emotional want for the newest or even more so the most recently retired Filo. FILOMETER: A device for measuring how long one remains satisfied with the current in-use binder or setup. Often needs to record quite short periods. Filopanic: The state you are in, when the filo you won on eBay never arrives! Filosaurus: The file that will hold the gems from this thread!! Filostalker: What I've been reduced to when I'm out in public and I spot someone with a Filofax or similar and I have to drum up the nerve to compliment her on her planner...or keep quiet, lose the nerve and just spy. Filostand: What your nightstand morphs into on any given night. FILOSTARE: That awkward moment when you accidentally half-rip out a page of your beloved Filofax, stare at it in disbelief and think 'I can't believe I just did that!" FiloTed: For those of us who cuddle our Filofaxes all night long! Filotot: A newbie with Filos. Filotots are newbies up until 1 year of owning filos, maybe? Lol ... Then, filokid, filoteens, filodults, filograms/filogramps or filonans/filopopas?? Filotubed: How you feel after viewing all of the Filofax videos on a Saturday. FiloWait: That many days between ordering your Filofax and the postman delivering it. Filowildered: Confusion connection with the decision whether one should get the purple or the ochre, the Malden or the Holborn..
FLAGFAIL: When you're at the shops and being handed by a complete (but caring) stranger the small fluorescent adhesive flag that was stuck precariously on your backside! Fliofaxophile: Lover of all things filofaxish, including being a member of Philofaxy and friends of Philofaxy. INFAXUATION: Living eating breathing all things Filofaxish. Pickled Filo: Being drunk in charge of a Filofax. RING-RUSTY: A condition that sometimes afflicts binders in humid climates. RING-SCREAM: The sound you hear when the rings close on that small web of skin between thumb and forefinger. SINGULARITY: Theoretical future state in which one can work on a long term basis with just one Filofax binder. SMARTPHONE: The telephone in ones hallway which is dusted weekly and whose cord.is kept untangled. Spyfax: Noticing someone in a meeting has a Filofax and sneakily trying to work out what it is! Just don't get caught.... Spyfaxfail! Wishi washi: Hoping you can still buy the same roll you just ran out of. Thank you to: Kent Buchanan, Angela McSloy, Karine Tovmassian, Lynda Noland, Susan Stanaway, Dizzy Moras, Rebecca Cripps, Robyn Placek, Julia Driscoll, Sam Hollinsworth, Shelly Sharp-Wittschiebe, Lindsay Jones, Katerina LeNoir, Cheryl Turtlemoon, Kate Bernasconi, Linda Saper, Ray Blake, Amanda Bigrell, Alan Marshall, Emma Meek, Tessa Kidd, Deborah Hadley and Sara Williams for all your contributions! And of course you can have this list in your Filofax! Over the years I've been asked most of these questions more than once. Therefore it made sense to turn them in to a post of some sort! 1. When did you start the blog? I didn't start Philofaxy, that honour was another guy by the name of Matt from the USA. He started it in October 2005. Nan joined him in June 2006. Matt disappeared to spend more time with his family at some time after then. Laurie and I joined Nan in June 2009, Anita joined the team in May 2012. 2. Who are the team, can I join? You can find out more details about the current gang of four on the 'About' page. If you would like to join the team then why not try writing a guest post or two first. Or contribute a few ideas for future posts. 3. What are the organisers in the photo at the top of the blog? 4. How much do you charge for a review? We do not charge for reviews. Naturally if the company donates the sample we are very grateful. I don't keep them all. Over the years a lot of the review samples have been given away as prizes. I hope you as potential customers find the reviews useful and the companies gain some new customers. Some samples are only loaned to me for a limited period to do the review and then returned to the company. In this case the company will arrange shipping in both directions so it is just my time and my own photography equipment that is used. 5. How do you find the blog posts? Over the years I've built up a system with a large number of blogs and You Tube channels in it. It reads the RSS feeds from these sites and lets me know when there are new posts and new videos for consideration. I then check each one and determine if it will be included or not. Google doesn't highlight that many blog posts these days. Therefore my own system is much better. The system is affectionately known as Gromit the cartoon character from Wallace and Gromit. Back when we had a Windows 3.11 network at home the network name was 'Wensleydale' rather than 'Workgroup' and each computer or printer on the network had a character name from the series, for instance one of the printers was 'Preston' ! Gromit was my desktop machine that the system originally started on! The same system is used for Travellers Notebook Times as well. We are always looking for new blogs and channels to include for both sites. 6. How many visitors are there per day to Philofaxy? Not as many as we would like! I started collecting stats in August 2009, since then there have been about 5.25 million visits with about 14 million page views. Our best year was in about 2014 terms of visitor numbers. But with other forms of social media competing for peoples attention/time our visitor numbers have declined a bit. These days we get about 1500 visits per day but it varies each month during the year, increasing in December/January when people are looking for new diary inserts. And we get 3000-3500 page views a day. Quite respectable figures for a niche blog! 7. How many blog posts have you written? I honestly don't know the answer to this one. This post is number 3976 of all of the posts on Philofaxy, but I have no idea what proportion of them I have written. Before I joined the team I read all of the posts from the first one through to the current one back in 2008. Then I did it a second time including the comments. I've not attempted to do that recently! I can remember most of them that I've written, but I have to use the search to find them because I'm useless at remembering when I wrote them! Not a great deal! There is some affiliate links used to Filofax and Amazon. I do have expenses to cover such as postage and the cost of the server that the diary inserts are hosted on as well as the podcast. However I am happy to do this for zero profit. Why? Well let me explain. Through the 'work' I do with the companies they are happy. They also have happy customers. And I've gained a lot of friends through the 'work' I've done on Philofaxy and you can not put a value on friendship? What earning I do make they are all declared on our annual French tax return! Sad I know but I prefer to keep everything simple and straight forward. 9. How did the name Philofaxy come about? I can't be 100% certain but it might have been to avoid trademark issues with Filofax. In English Ph is a similar sound to the letter F so changing F for Ph avoids the trademark issue! I've even registered: http://philofax.co.uk Filofax obviously didn't think about spelling variations! 10. Do you read all the posts and watch all the videos that go in to each webfinds? I used to, but these days, the blog posts are given a quick scan for consideration for inclusion. With the videos it would take too long to look at each one, so I look at the title and the thumbnail of the video and may be a quick scroll through the video to assess it for inclusion. I do go back and read or watch the ones that are of interest to me. I do enjoy writing reviews as well as my 'travelogues'. As a keen amateur photographer for many years, improving my technique for photographing organisers has taken me longer than I would have liked, but after investing in some studio lights it is now much easier to do. I generally start off by taking the photos and work out the 'story' I'm going to tell with the series of photos. A full review can take 2-3 days to do including the photos. When I've been on one of my unannounced visits like the trip to Italy with Gillio or to the Van der Spek workshop, I love to draw the reader in at the start and carry them along with the trip. I've also had a lot of fun writing posts which have evolved gradually like the reveal we did of the new Filofax range in 2012. I did this one with the help of Alison my dear author wife. She took my basic idea and added a bit of 'drama' to it. She said what are you going to say next? I was laughing... 'Nothing' was my reply. That was cruel! So the post went out and the reaction was incredible. I had planned part 2 to be published the next day, it wasn't even written at that point so whilst the death threats poured in, I quickly got to work writing the real 'reveal' !! I was discussing this with Anita recently, we both agreed that the Free For All Friday posts are the hardest ones to write, trying to think up a suitable topic every four weeks. Yes we do sometimes cheat by looking back at similar ones from pervious years! 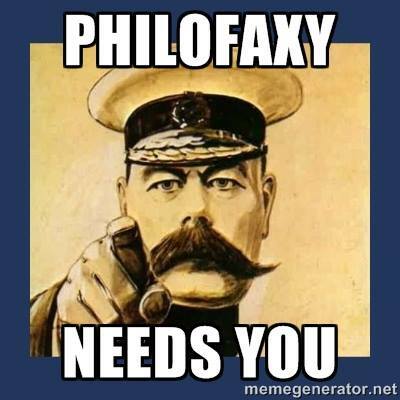 @Philofaxy is our main Twitter account, it shares the post from Philofaxy each day. @PhilofaxyNews is an automated account, it relays posts from the Filofax Focus Flipboard magazine. I hope I've answered most of your questions.... if not drop your question in the comments below. Diary Inserts: A huge collection of diary inserts for A4/A5, Personal, A6, Pocket, Mini and M2 sizes for you to download and print yourself. Links: Links to lots of blogs and other Filofax related sites, yes it is on my list of things to update this page as soon as I get some time! Linking back to Philofaxy - If you would like to link back to Philofaxy from your website or blog we have a 'badge' with the exact code which you will find at the bottom of the side bar. Skype Roundtable Voice and Text Chats - once a month we have a Skype video/voice conference, this is open to anybody to join in. It is an open agenda and we don't only get to talk about Filofax things. People taking part can be spread around the world, so it can be quite educational as well as good fun. Look out for announcements on the blog about when the next one will be. Generally they are the first Sunday of the month, but they can move slightly if this conflicts with public holidays or Steve's travel arrangements! Meet Ups - We have held several very successful meet ups, they vary in size from as little as two or three people up to twelve people, these have been held in London, New York, France, Holland, Belgium with other ones planned for other countries around the world. We welcome people to do guest posts on Philofaxy, but they must be about ring bound planners of some type or be associated with planners, time management in some way. We do not respond to requests to post links along with guest posts about pensions, raising a family, investment opportunities in the Scilly Isles, etc. etc.... yes we get frequent offers like this in the Philofaxy in-box! If you would like to do a genuine guest post this post will be a great help to you. Functional Planning In My Foxy Fix planners - Fran Plans! !